In your app configuration, you can link to all the external services using localhost and the default port numbers in the diagram above. The rest of this article is about the specifics of configuration, and the commands and aliases that you may find useful. """Confirm that trifecta services are running.""" We now have all the required settings. However, the tests will still all fail, for the very simple reason that none of the required services are actually running. Et voila. We (should) have a working Django project, running inside a virtualenv, connecting to Postgres, ElasticSearch, Memcached and Redis, all of which are running as Docker containers. 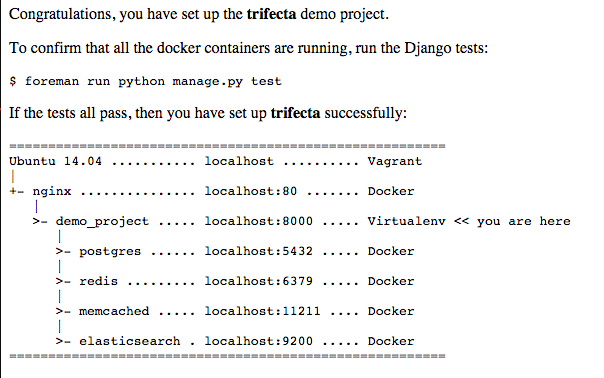 alias forage="foreman run python manage.py"
The trifecta VM is now available on the Vagrant box repo, Atlas, under yunojuno/trifecta, which means that you can create a trifecta project by building off this in your local Vagrantfile (using config.vm.box = "yunojuno/trifecta"). The box doesn't contain the demo project - in order to run your project on the VM simply follow the pattern above, replacing the demo_project directory with your project.